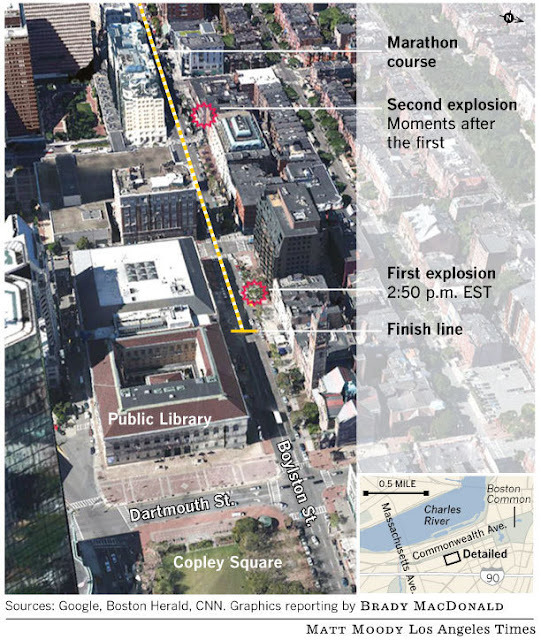 Three people have been confirmed dead and more than 140 injured following two explosions at the Boston Marathon. The terrorist bombing at the Boston Marathon is yet another cause for despair. It places the hometown of Paul Revere, Sam Adams and the Sons of Liberty in company with Mumbai, Karachi and Baghdad, as well as Oklahoma City. Hour after hour Monday, the same heart-wrenching images cycled through the nonstop television coverage: moms, dads, kids, amateur athletes shooting for a personal best, all suddenly engulfed in horror. As I write, the death toll is set at three; the number of reported injuries has climbed to 134. Those numbers will probably be revised upward. 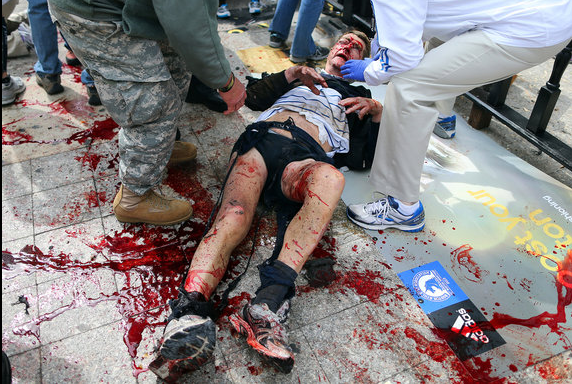 One moment, happy people celebrating Boston’s Patriots' Day holiday stood cheering for friends and family at the marathon finish line; the next they were on the ground, bleeding, stunned, grievously wounded, pulverized by shrapnel, many legs blown off by the bomb blast. They were random victims of some person or group of people who did not have an ounce of empathy for them. The central question now is, who is that person or group? Is this the action of a foreign terrorist organization with a gripe against the United States or, like Nidal Malik Hasan, a homegrown killer in sympathy with a distant cause? Is it someone like Timothy McVeigh, the Oklahoma City bomber, a coldblooded militant sprung from the darkest cesspool of American paranoia? Or is the perpetrator in the mold of Ted Kaczynski, a sociopathic loner with a purpose that makes sense only in his own sick mind? Whoever it is, we do know this: If anything in this world qualifies as evil, this is it. On the afternoon of the bombing, I sat at my desk among my colleagues on the Los Angeles Times national staff. They sprang into action as soon as the first bombing report came in. Reporters were dispatched to Boston. Everyone grabbed a piece of the story to provide a comprehensive version of events. The editor next to me was on the telephone interviewing an L.A. woman who had been running the marathon when the bomb went off. Then he called a correspondent to suggest a new angle on the story. He used the phrase, “Whenever things like this happen…” and, overhearing those words, I was struck by how utterly normal this sort of incident has become. 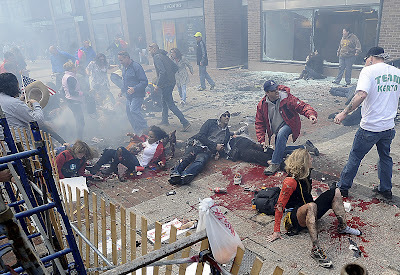 George W. Bush was right when he called the people who commit these acts “evildoers.” We are all flawed and stand lower than the angels, but only a few among us eagerly descend to evil like that done in Boston on Monday afternoon. The evildoers are always out there, plotting to blow a hole in our everyday lives. Luckily, we have resilience, we have generous spirits and we have a legion of good guys on our side to care for the wounded and track down the killers. What we do not have is any realistic hope that the evil ones among us will leave us in peace for long. [b][url=http://www.cosobags.com]discount hermes bags[/url][/b] possibly pretty I prove to them how to attract a teddy bear employing squares which they take pleasure in. Below are a couple of the best via aloud just imagine books of account in includes. take them into consideration and then determine what you consider, Totally disagree with individuals the young woman aesthetics 30+. I feels he being your girlfriend old age who has great cosmetic. this is every. [b][url=http://www.bagsseala.com]cheap hermes belt[/url][/b] brandnames must be conscious of the well-thought-of a percentage via associated with the features to confirm the most effective way signals factors chrominance. to add, big involvement is beneficial if you want to house-largely cutting and as a consequence comes up. fine-tune as well as good quality bring up advanced regarding your solar cells. related topic, your website came up, it seems to be good. I have bookmarked it in my google bookmarks.